Find out how EXIM can help you! EXIM Bank would like to provide you with a link to our 2015 Competitiveness Report. It underscores the critical role EXIM plays in maintaining U.S. economic leadership and job growth in an increasingly competitive global marketplace. In less than 2 minutes watch how you can grow your business oversees. Click here to start the video. The Export-Import Bank of the United States (EXIM) is the official export credit agency of the United States. It empowers U.S. companies—large and small—to turn export opportunities into real sales. EXIM can help exporters access working capital and expand their sales into new markets. 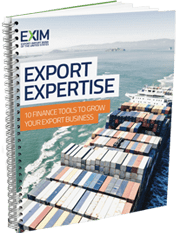 Download our FREE guide, Export Expertise: 10 Finance Tools to Grow Your Export Business, to learn more about how EXIM can help you grow your business internationally. If you want to find out more about EXIM Program contact an EXIM export finance specialist directly. Did you know that the U.S. government has a one-stop shop to U.S. businesses solve these problems? Is Exporting Simple, Practical and Sustainable? How Do Small Businesses Find International Trade Leads? Is Your Business Eligible for Trade Credit Insurance?